As a candidate for governor, Martha Coakley has strongly criticized the troubled Department of Children and Families, saying it overloads its social workers and is unable to properly protect children from abuse. 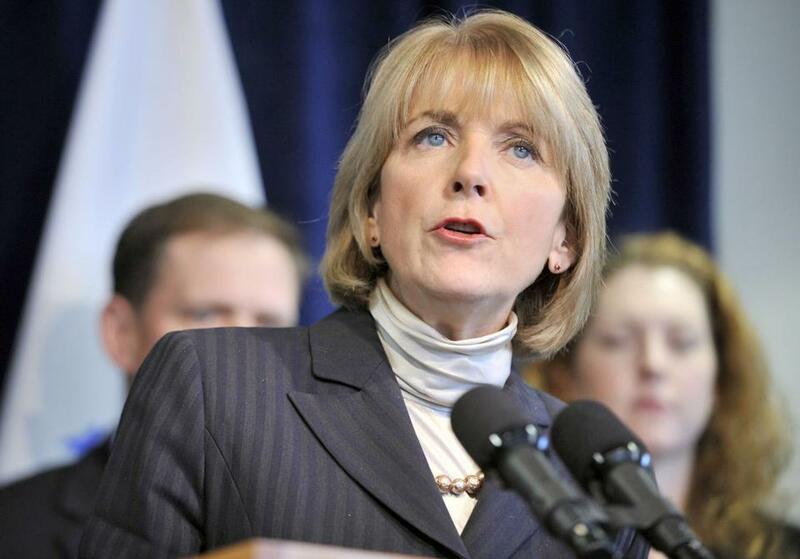 “During my career, I have seen, day in and day out, how the current structure of DCF puts children at risk and overburdens social workers,’’ Coakley said in a statement released by her gubernatorial campaign. She vowed that, as governor, she would put in place crucial changes needed to protect children. But that criticism stands in sharp contrast to the strong defense that Coakley, in her role as the state’s attorney general, has provided to the agency in a lawsuit brought by a child welfare advocacy group. The suit, currently before a federal appeals court, seeks to force the agency to tighten up its monitoring of children and boost standards of care and safety. Since the April 2010 filing of the suit, Coakley has repeatedly insisted in court documents that the Patrick administration has already taken strong steps to meet the standards that Children’s Rights, a New York-based watchdog group, is demanding. “In fact, DCF has developed a thorough system with the requisite flexibility needed to successfully provide services to meet the vast of array of needs presented by its eclectic client base,’’ Coakley and her staff argued in one Dec. 3, 2012, brief. She presented that statement a year before news broke that the agency had lost track of Jeremiah Oliver, a 5-year-old Fitchburg boy who has been missing since September and is feared dead. The state has determined that a Department of Children and Families social worker had not properly monitored his case. Coakley’s conflicting statements on the state agency’s performance highlight the hazards of her dual roles as an attorney general charged with vigorously defending the state in court and as a candidate for governor who is now criticizing a state agency’s practices and promising to improve its performance standards. Because the case is still pending, Coakley declined to be interviewed. But through a campaign spokesman, she insisted that there is no conflict between her defense of the agency in the lawsuit and her criticism of it as a candidate. Children’s Rights says that Coakley and the Patrick administration were particularly aggressive in trying to repel the changes that the children’s advocacy group is seeking, which the group says would address the sort of breakdowns in the Oliver case. “We made it very clear that we were interested in settlement discussions . . . but the state would not engage in settlement discussions,’’ said Marcia Lowry, Children’s Rights executive director. Children’s Rights has filed at least 20 similar lawsuits against child welfare agencies across the country and has settled at least 15. Coakley and the governor are among the few who have chosen to wage a prolonged battle. But Alec Loftus, spokesman for the Patrick administration’s human services agencies, rejected Lowry’s and Bartosz’s statements. He said the state has been in conversations with the group about its proposals before and during the lawsuit, but felt its demands for change were excessive. Children’s Rights, which is appealing a US District Court decision, has been seeking to force the Department of Children and Families to address several of its operational breakdowns, including the failure of some of its social workers to make monthly visits to children it monitors. That issue is at the center of the Oliver case. As the Oliver case continued to dominate much of the headlines for the last five weeks, Coakley’s gubernatorial campaign called for creation of a separate Child Protection Division within the agency that would investigate allegations of neglect and abuse of the children that the agency serves. In a Jan. 7 press release, candidate Coakley complained that the agency has no dedicated division focused on children’s safety. “As governor, I will be committed to implementing the crucial changes needed to help ensure that no child is the victim of preventable sexual, physical, or serious emotional abuse,’’ she said. She lamented that the department is currently split between its duty to preserve families while trying to protect children from harm. “The inherent conflict between DCF’s responsibility to children and their focus on strengthening families increases the risk that a child will be left in an abusive or neglectful environment for too long,” Coakley said in her campaign statement. But in the lawsuit, Coakley painted a much rosier picture of the agency. “In contrast to plaintiff’s sweeping allegations, the evidence will show that the defendants consistently and proactively exercise professional judgment and adequately respond to the needs of the children in DCF custody,” she stated in one brief seeking to dismiss the case. US District Court Judge William G. Young ruled against the plaintiffs in November, although he issued a scathing opinion in which he acknowledged that Children’s Rights had documented a “laundry list of problems plaguing DCF.” He attributed the failures to the Legislature’s decision to underfund the agency. “DCF has failed not only to comport with national standards of care and state and federal requirements, but also to comply with its own internal policies,’’ Young wrote. Children’s Rights has appealed the ruling. Frank Phillips can be reached at frank.phillips@globe.com. Michael Levenson can be reached at Michael.Levenson@globe.com.